Students at Cannon County High School will have a new principal when school starts Friday. Director of Schools Barbara Parker has appointed Mike Jones as principal at Cannon County High School. 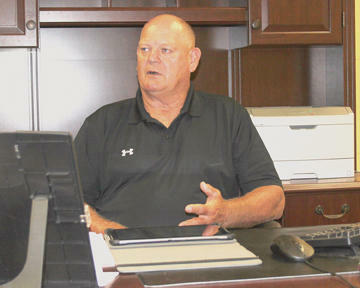 Jones replaces Tim Knox, who resigned to take an administrative position at Coffee County High School in early July. "My goal was to have someone in place before school opened so they could get acclimated to the school, the rules and initiate some things the new principal would want to start from day one, so we are excited about that," Parker said. Jones, 67, is a veteran of three school systems - Cannon, Rutherford and Williamson. He spent most of his career as an educator teaching mathematics and science, as well as serving as a football, basketball and baseball coach at various stops. "I've very excited to be here. It's been a long time coming," Jones said. "I've wanted to be a principal for a long time because I feel I have something to give these students. I'm looking forward to the challenge." Jones was hired last Thursday (July 25) and was still in the process of meeting faculty and getting acclimated to his new position at the outset of this week. The first week has been a whirlwind of activity. "The timing is not the best but we can't change that," Jones said. "I have a short time to do a lot of things (this week), and I to catch up on great deal of things. I know I have a lot to learn. It is going to be a busy time for me the next few weeks." Jones began his career as a teacher at Woodbury Central High School in 1971. He remained at Woodbury, where he also served as assistant football coach under Mike Mayfield, until 1973. He worked in the Rutherford County system before spending the last several years in the Williamson County system. "His experience is a big plus," Parker said. "He has worked in three school systems from small to medium to large. He has taught math and science which are very important subjects in high school for accountability. "The people skills are there and he is able to relate to students and adults of all ages. Discipline is also strength. He is a strict disciplinarian." Jones said the rules will be the same for all students; however, the rules in place will be followed. "I am what I am," Jones said. "If I tell you that is the way it is and we have rules, then those rules will be enforced. It is that simple. We don't' have certain rules for some and different rules for others. The rules have to be uniform." Accountability and discipline are important factors for Jones but the veteran educator also strives to make sure students are understanding curriculum. "Curriculum is a big deal with me," Jones said. "We want to make sure students are getting the best education they can. Every child needs to learn to their ability. Learning can be fun and we want to make it that way for the students. We want them to enjoy school. It may be difficult for some but we want them to want to come to school." Do not expect sweeping changes from the new principal initially. Jones said he will be observing, watching, listening and learning as he gains an understanding of what works well and what needs changed in the coming weeks. "I am not here to make a lot of changes," Jones said. "I am here to make sure the kids have a safe environment. My number one thing is the safety of the children. I have seen a lot of changes (in education) through the years. If I see something working I will leave it alone, but if I see something not working we will change it." Friday's first day of school is an abbreviated day (7:45-10:30 a.m.). The first full day of school is Tuesday (Aug. 6). Was wondering if someone will finally get the drugs out of the school.